For a full written and photo report of the retreat, go to the Eastern American Diocese of ROCOR. Audio and video versions of this lecture will be forthcoming; please check back to orthodoxethos.com for these. However, discernment of the methods of the fallen spirits, or demonology, is a requirement in the formation of Christology and Ecclesiology. As the Evangelist John writes, "For this purpose the Son of God was manifested, that he might destroy the works of the devil” (1 John 3:8). The absence of any mention of the evil one or his machinations (heresy, schism, etc.) from any conciliar text is indicative of a worldly, secularized outlook, not the patristic mindset. Let us now turn from the organization of the "Council" to its documents. Three of the six documents presented serious problems for several of the Churches. These were: The Mission of the Orthodox Church in Today's World, The Sacrament of Marriage and Its Impediments, and Relations of the Orthodox Church with the Rest of the Christian World. I will speak only briefly concerning the second text and focus on the third, which really constituted the basis of the Council. 1. Marriage between Orthodox and non-Orthodox Christians is forbidden according to canonical akriveia (Canon 72 of the Penthekte Ecumenical Council). 2. With the salvation of man as the goal, the possibility of the exercise of ecclesiastical oikonomia in relation to impediments to marriage must be considered by the Holy Synod of each autocephalous Orthodox Church according to the principles of the holy canons and in a spirit of pastoral discernment. 3. Marriage between Orthodox and non-Christians is categorically forbidden in accordance with canonical akriveia. Now, to be sure, this question of mixed-Marriages is a thorny and difficult pastoral matter, especially for the Church outside of traditional Orthodox lands, such as America. Without wanting in the least to belittle this pastoral challenge, a challenge rightly dealt with by the pastors on a case by case basis, it is imperative that the pastoral practice never be loosed from its dogmatic moorings. My interest here are the dogmatic implications of this decision. In the relevant excerpt I read of the conciliar document, note that while the kat'oikonomia marriage of the Heterodox with the Orthodox is considered possible, the same is strictly forbidden for the non-Christians. Why the difference? On what basis are the Heterodox admitted to a mystery of the Church? What are the criteria of acceptance? What is significant here is that the Council in Crete introduced, for the first time in history, a synodical decision which allows for the overturning of a canon of an Ecumenical Council and - most importantly - its underlying dogmatic basis. I don't see how one could understand it otherwise, for on what basis are they allowing for mixed marriages if not some (new) consideration of the Church and Her Boundaries, now including the heterodox (somehow - "because they are baptized"?). For, otherwise, it would be madness to speak of marriage - a true mystery of unity in Christ - between a baptized and initiated member of the Body of Christ and one not baptized and not initiated. Therefore, the implication, even when the decision is referred to as "kat'oikonomia" here, is that the heterodox are "baptized" and on this basis they (as opposed to those of other religions) can participate in the mystery of marriage. Indeed, this is what one hears when he pays attention to the reasoning of those champions of mixed marriages. This, however, means that underlying the supposed "oikonomia" of mixed-Marriages is the so-called "baptismal theology" and "inclusive church" theories, which lie at the heart of syncretistic ecumenism. This is consistent with the fruits we have seen from mixed-Marriages, namely, that on the basis of mixed-Marriages the ecumenically-minded justify other violations of the canons, such as joint prayer with the heretics, or even communing them during the marriage ceremony. (I am told that, in fact, this is practiced by a prominent professor at a North American Orthodox seminary). It is clear that there is no theological basis for mixed-Marriages, that it cannot be considered "oikonomia" since it does not lead to akriveia, but rather overturns the unity-identity of the mysteries with the One Mystery of Christ, and that it opens the door to further erosion of the canonical and sacramental order of the Church. Let us turn now to the text which many consider constituted the basis of the Council: "Relations of the Orthodox Church with the Rest of the Christian world." It is the common view that this text, the sixth and final text accepted by the "Council," is fraught with error and confusion, notwithstanding occasional praiseworthy passages. As a text with a clear dogmatic-ecclesiological orientation this text ought to have been distinguished by an absolute clarity of meaning and exactitude in formulation, such as to exclude the possibility of a variety of interpretations or intentional misinterpretations. Unfortunately, to the contrary, in key passages we encounter obscurity and ambiguity, as well as theological contradictions and antinomy, which permit polar opposite interpretations. It is characteristic with what difficulty the "Council" met the task of approving this text that nearly thirty bishops refused to sign it and many others only signed it after the termination of the Council, after the four versions (in four languages) had finally been completed. "When the minutes of the Council are published, where the true views of those who decided on and signed the text are recorded, then it will be clear that the Council was dominated by the branch theory, baptismal theology and especially the principle of inclusiveness, i.e. a retreat from the principle of exclusivity to the principle of inclusiveness. During the works of the Council in Crete various distortions of the truth were said [in order to bolster the text] regarding St. Mark of Ephesus, the Council of 1484 and the Synodical encyclical of the Eastern Patriarchs in 1848, with regard to the word "Church” as applying to Christians cut off from the One, Holy, Catholic and Apostolic Church." The Metropolitan relates elsewhere that proponents of the text and the recognition of the "ecclesiality" of the Western confessions employed aggression and much pressure, including explicatives against those opposed. We mentioned earlier that one of the aims of this "Council" was to solidify the Orthodox Church's commitment to ecumenism. This text on relations to the Heterodox achieves this goal. It contains positive references to the World Council of Churches, made with apparent enthusiasm. "The Orthodox Church wishes to support the work of the Commission on 'Faith and Order' and follows its theological contribution with particular interest to this day. It views favorably the Commission’s theological documents, which were developed with the significant participation of Orthodox theologians and represent a praiseworthy step in the Ecumenical Movement for the rapprochement of Christians." The positive evaluation of the texts accepted within the WCC alone is sufficient for an Orthodox Christian to reject the text. Is it possible for a Pan-Orthodox Council to favorably view theological documents of the WCC when these very texts are filled with heretical Protestant views that have been repeatedly criticized by many Local Orthodox Churches? there is a "Church within a Church." Upon this foundation the Orthodox participate in the WCC, an organization in which the anti-Orthodox "invisible and visible Church" theory clearly dominates, overturning the whole of Orthodox ecclesiology. The "Council" of Crete is the only council of bishops ever to recognize, promote, praise and accept ecumenism and the World Council of Churches. This stands in direct opposition to the witness of the choir of saints, including - among many others - the great elder Ephraim of Katounakia who by revelation was informed that ecumenism is dominated by unclean spirits. The implications are enormous: what experience and inspiration of the Holy Spirit could they be expressing in Crete when they stand in opposition to the saints of the Church? This path to the conciliar acceptance of ecumenism has been long and tumultuous. The passage of this text on Ecumenism was clearly the number one goal of the visionaries of the "Council" - a goal which was apparent as early as 1971. This phrase was later modified at the Third commission meeting in 1986 to "recognizes the actual existence of all the Christian Churches and Confessions." It was changed again in 2015, at the Fifth such meeting of the preparatory commission, to "recognizes the historic existence of other Christian Churches and Confessions not found in communion with Her." When, in January of 2016 the final text was finally made public, this phrase provoked a host of reactions and protests from the fullness of the Church and Local Church Synods, including the Russian Church Abroad. After the last minute proposal in Crete in June of 2016 by the Archbishop of Athens was generally accepted by the Primates and their entourages (although nearly 30 bishops refused to sign), the final text included the formulation: "the Orthodox Church accepts the historical name of other heterodox Christian Churches and Confessions that are not in communion with her." One can see that progressively, over the last 45 years, the phrase has been modified in response to objections advanced by the Local Churches. Nevertheless, the final version remains unorthodox and unacceptable, or, as Metropolitan Hierotheos (Vlachos) writes, "anti-orthodox." There are several important points to make in this regard. Firstly, as Metropolitan Hierotheos remarks, it may be that, in accepting the term "church" for the heterodox confessions, an important distinction was lost on the participating hierarchs. St. Gregory Palamas clearly defined this issue in the Synodical Tomos of the Ninth Ecumenical Council of 1351. He writes there: "it is one thing to use counterarguments in favor of piety and another thing to confess the faith." That is, one should use every argument in countering something, while confession should be brief and doctrinally precise. Hence, in this context, in council, for the sake of doctrinal precision the use of the term "church" for the heterodox is clearly inadmissible. We can only hope, together with Metropolitan Hierotheos, that the hierarchs in Crete "were 'misled' by those who argued - without extensive references - that during the second millennium the Orthodox characterized heretical groups as Churches. The truth is that it wasn't until the 20th century that Western Christianity was characterized as a church, when Orthodox terminology and theology was differentiated from the terminology and theology of the past, especially with [and after] the 1920 Encyclical of the Ecumenical Patriarchate" "Unto the Churches of Christ Everywhere." One has only to recall that St. Gregory Palamas likened the Latin heresy akin to Arianism and the Latins as being obedient organs of the evil one. Although it has been claimed that the offensive phrase referring to "churches," particularly in its last form, is consistent with Orthodox ecclesiology and the Apostle Paul, the truth is that it is, rather, consistent with the new, "inclusivist" ecclesiology. As Metropolitan Hierotheos stated: "while prima facie it seems harmless, it is anti-Orthodox." Why "anti-Orthodox?" Firstly, it is impossible to speak of "simply" "accepting the historical name" of "other heterodox Christian Churches," for there is no name without existence, because otherwise an ecclesiological nominalism is expressed. Secondly, far from hearkening back to the Apostle Paul, "the mouth of Christ," the phrase "the Orthodox Church accepts the historical name of other heterodox Christian Churches," when understood in context, reminds one of the invisible church theory of Calvin and Zwingli, what Vladimir Lossky called a "Nestorian ecclesiology." This ecclesiology supposes that the Church is split into invisible and visible parts, just as Nestorius imagined the divine and the human natures in Christ to be separated. Other heretical theories have sprung from this idea, such as the branch theory, baptismal theology and ecclesiological inclusiveness. This invisible church theory has actually already been rejected in council by the Orthodox Church. The idea that a church can be characterized as heterodox (heretical) was condemned by the Councils of the 17th century on the occasion of the so-called "Confession of Loukaris," supposed to have been written or adopted by Kyrillos Loukaris, Patriarch of Constantinople. The condemned phrase was: "it is true and certain that the Church may sin and adopt falsehood instead of the truth." On the contrary, the Councils of the Church at the time condemned this faithlessness to Christ declaring that the Church cannot err. This conciliar teaching is very important and must be stressed again in our day, for it comes to heal the delusion of those humanists in our midst who have lost faith in Christ and the continuation of the Incarnation. It is this faithlessness that lurks behind the unwillingness of many to embrace the "scandal of the particular," the scandal of the Incarnation, and to declare that the Church is One as Christ is One, and it is in a particular time and place, being the continuation of the Incarnation and the One, Holy, Catholic and Apostolic. This faithlessness amounts to an abandonment of orthodoxy as a pre-requisite of ecclesiality and it is not simply a crisis of convictions, but, as Fr. George Florovsky wrote some 60 years ago, it signals that people "have deserted Christ." It begins by stating that according to the ontological nature of the Church, unity cannot be disturbed. Here the invisible, united Church in the heavens is implied. This is the meaning of "ontological." This is immediately followed by, "but in spite of this..." and reference is made to the fractured, visible aspect of the Church, with the acceptance of other, "Heterodox Churches." "The One, Holy Catholic and Apostolic Church, founded by the "Word in the beginning," by the one "truly with God," and the Word "truly God", according to the evangelist of love, unfortunately, during her engagement on earth, on account of the dominance of human weakness and of impermanence of the will of the human intellect, was divided in time. This brought about various conditions and groups, of which each claimed for itself "authenticity" and "truth." The Truth, however, is One, Christ, and the One Church founded by Him. Both before and after the great Schism of 1054 between East and West, our Holy Orthodox Church made attempts to overcome the differences, which originated from the beginning and for the most part from factors outside of the environs of the Church. Unfortunately, the human element dominated, and through the accumulation of "theological," "practical," and "social" additions the Local Churches were led into division of the unity of the Faith, into isolation, which developed occasionally into hostile polemics." The similarity with the invisible Church theory condemned by the Church and these words of the Patriarch are apparent in the sharp distinction of the ontologically united heavenly Church with the supposedly fragmented earthly Church. This mirrors the "Nestorian" division of the divine and human natures of the Body of Christ. This view is, however, not surprisingly, in harmony with the new ecclesiology propounded at the Second Vatican Council, which posits an earthly church with greater or lesser degrees of fullness due to the so-called "tangles of human history." "O the derangement and distraction of these [men]. They did not separate between the profane and the holy, and as tavern-keepers mix wine with water they mixed the true word with the perverted, truth with falsehood, just as [as if they were] mixing poison with honey, to whom suitably does Christ our God address through the prophet: 'the priests set aside my law, and defiled my sanctuaries. They did not distinguish between the profane and the holy." It should be clear, then, that the offensive text with its heretical ecclesiology must be rejected by the Church (by every Local Church separately and then in a future Council), and replaced, for it will undoubtedly be the source of a falling away from Orthodoxy. There is still time to correct course and heal the wound already inflicted upon the Church. One practical solution, given by Metropolitan Hierotheos, which would help facilitate the restoration of Orthodoxy, is for a future council to correct the errors and to issue a new, orthodox document. There is both contemporary support for this (from the Patriarchates of Antioch, Serbia, Russia, Georgia, Bulgaria and even Romania) as well historical precedent (the meetings of the Ecumenical Councils extended for months and years, the Penthekte Council completed the 5th and 6th Councils and the Ninth Ecumenical Council was actually four separate councils). Let us hope that bishops everywhere take immediate steps in this direction, for the matter is most urgent in those Local Churches which have accepted the text and Council. Let us now turn briefly to the aftermath of the council and the current state of things. Firstly, among those who attended the Council, there were nearly 30 bishops who refused to sign its final document on the Heterodox and Ecumenism. Among those are the well-known bishops, Metropolitans Hierotheos (Vlachos) of Nafpaktou (Greece), Athanasius of Lemesou (Cyprus), Neophytos of Morphou (Cyprus), Amphilochios of Montenegro, (Serbia), and Irenei of Batskas (Serbia). "Concerning the recently concluded, triumphantly yet not entirely persuasively, "Great and Holy Council" of our Church in Columbari of Crete: it is already not recognized as such by the Churches that were absent, indeed even characterized by them as a "gathering in Crete", and also disputed by most of the attending Orthodox hierarchs!" The supporters and sympathizers of the Council call upon the example of the Second Ecumenical Council as precedent, as an example of a council at which some Local Churches were absent (namely Rome and Alexandria). What they do not say, however, is that the Second Ecumenical Council was not called as an Ecumenical or Pan-Orthodox Council to begin with, but rather as one of many Local Councils of the Eastern Empire and on account of the Orthodox decisions that were made it was later accepted by all of the Local Churches as Ecumenical. In Crete we actually have the opposite: it was called as Pan-Orthodox and four Patriarchates refused to attend. Moreover, and most importantly, they also have refused to recognize it as a Council, even after the fact. The Patriarchate of Moscow (in the July 15, 2016 decision of its Holy Synod) stated that "the Council which took place in Crete cannot be considered Pan-Orthodox, nor can the documents which it ratified constitute an expression of Pan-Orthodox consensus." 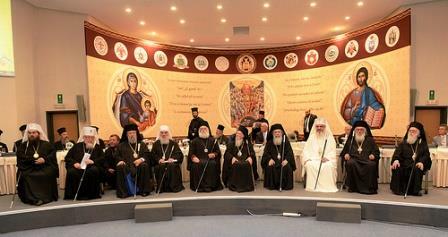 The Patriarchate of Bulgaria (in its decision dated November 15, 2016) stated in a gathering of the entire hierarchy that "the Council of Crete is neither great, nor holy, nor Pan-Orthodox. This is due to the non-participation of a number of Local autocephalous Churches, as well as the accepted organizational and theological mistakes. Careful study of the documents adopted at the Crete Council leads us to the conclusion that some of them contain discrepancies with Orthodox Church teaching, with the dogmatic and canonical Tradition of the Church, and with the spirit and letter of the Ecumenical and Local Councils. The documents adopted in Crete are to be subject to further theological consideration for the purpose of amending, editing and correcting, or replacing with other (new documents) in the spirit and Tradition of the Church." The Patriarchate of Georgia met in December of last year and issued a final decision on the Council of Crete. In that it stated that it is not a Pan-Orthodox Council, that it abolished the principle of consensus and that its decisions are not obligatory for the Orthodox Church of Georgia. Furthermore, the documents issued by the Council of Crete do not reflect important critiques made by the Local Churches and they are in need of correction. A truly Great and Holy Council does need to be held and the Georgian Church is confident that it will take place in the future and it will make decisions by consensus, based on the teaching of the Orthodox Church. Towards this goal, the Holy Synod has formed a theological commission to examine the documents accepted in Crete and to prepare for a future Council which will be Pan-Orthodox. The Patriarchate of Romania, which participated in the Council, later stated that "the texts can be explained, nuanced in part or further developed by a future Great and Holy Council of the Orthodox Church. However, their interpretation and the drafting of new texts on a variety of issues must not be made hastily or without Pan-Orthodox agreement, otherwise they must be delayed and perfected until agreement can be reached. The Autocephalous Orthodox Church of Greece, while not cataphatically ruling in favor of the final decisions of the Council, has issued an encyclical representing it as an Orthodox Council. Many have concluded that this stance signals agreement, even though within the hierarchy there are bishops which have sharply rejected and condemned the "Council." This confusion has given rise to disgust on the part of the faithful. Before I close, I believe it is also important to inform you of the latest developments with respect to the reception or rejection of the Cretan "Council" by the people of God. There have been positive responses, especially among the official organs of the participating churches, which have take the form of lectures and small conferences on the significance of the "Council," sometimes involving the Heterodox. One can also observe a surprising dissatisfaction among supporters that the "Council" did not do enough or go far enough in recognition of the Heterodox or in terms of other "hot button" issues for, mainly, Orthodox academics in the West. No doubt there will be a continued effort to influence the faithful in favor of the "Council" - a hard task, given that most never felt the "Council" was at all relevant to them. In spite of the official, positive reception given the "Council" in Greece and Romania, the overwhelming response among the people of God has been negative. The implications of the Cretan Council are far-reaching for many in those Local Churches which have accepted the Council. The response of many clergy, monastics and theologians to the favorable reception given to the Cretan "Council" by their hierarchy has ranged from written and verbal rejection by well-known theologians to the grave decision to cease commemoration of erring bishops by monastics and pastors. These and other, similar developments in the Ukraine, Moldavia and Romania serve to underscore the mounting pressure upon all the shepherds of the Church to respond patristically to the danger posed to the unity of the Church by the ill-planned and executed, and finally, anti-Orthodox, Cretan "Council." Church history clearly instructs us that this priceless unity in Christ exists and flourishes only when all are of "one mind" and confess the same faith in the One Church. Moreover, recent history also teaches us that accommodation of, or indifference to, a new, innovative ecclesiology, such as that expressed in word and deed in Crete, is not an option and will only lead to further polarization and shipwrecks on both the left and the right of the Royal Path. It is in such rocky spiritual seas as these that the skill of the spiritual leader is tested and confirmed, showing that he not only knows Truth but is also skilled in the WAY by which all can arrive at it safely. By God's providence, the Russian Orthodox Church Abroad continues to occupy a unique place in the Orthodox Church from which it can speak freely and even prophetically the word of Truth - "a word" which unites the faithful, healing old schisms and averting new ones. The Church Catholic has need of it now in these trying times. Through the prayers of our holy fathers, and especially the holy new martyrs and confessors, and by the wise pastoral guidance of our chief Shepherds, may we all continue in the saving confession of faith in the One Church, which is the continuation of the Incarnation - to the up-building of the Church and salvation of the world! I thank you all for your attention and graciousness in listening to me today and I wish you all a bright and radiant Pascha! Metropolitan Hierotheos of Nafpaktos and St. Vlassios, Intervention and Text in the Hierarchy of the Church of Greece (November 2016) regarding the Cretan Council: https://orthodoxethos.com/post/intervention-and-text-in-the-hierarchy-of-the-church-of-greece-november-2016-regarding-the-cretan-council. In an article dating back from when Ecumenical Patriarch Bartholomew was still a Metropolitan, in the journal The National Catholic Reporter, the Patriarch said the following, revealing his intentions for the Pan-Orthodox Council: "Our aims are the same an John's (Pope John XXIII): to update the Church and promote Christian unity... The Council will also signify the opening of the Orthodox Church to non-Christian religions, to humanity as a whole. This means a new attitude toward Islam, toward Buddhism, toward contemporary culture, toward aspirations for brotherhood free from racial discrimination...in other words, it will mark the end of twelve centuries of isolation of the Orthodox Church.” See: "Council Coming for Orthodox", interview by Desmond O'Grady, The National Catholic Reporter, in the January 21, 1977 edition. See also:http://orthodoxinfo.com/ecumenism/towards.aspx. See: J. S. Romanides, "The Ecclesiology of St. Ignatius of Antioch,” The Greek Orthodox Theological Review 7:1 and 2 (1961–62), 53–77. Due to its importance and the nature of the subject matter, an analysis of this text will be undertaken in a separate paper. My analysis will follow and be largely based upon that of Metropolitan Hierotheos (Vlachos) of Nafpaktou, Greece. Συνοδικἀ, ΙΧ, σ. 107, Γραμματεία Προπαρασκευής της Αγίας και Μεγάλης Συνόδου της Ορθοδόξου Εκκλησίας, Διορθόδοξος Προπαρασκευαστική Επιτροπή της Αγίας και Μεγάλης Συνόδου 16-28 Ιουλίου 1971, έκδ. Ορθόδοξο Κέντρο Οικουμενικού Πατριαρχείου Chambesy Γενεύης 1973, σ. 143, και Γραμματεία Προπαρα-σκευής της Αγίας και Μεγάλης Συνόδου της Ορθοδόξου Εκκλησίας, Προς την Μεγάλην Σύνοδον, 1, Εισηγήσεις, της Διορθοδόξου Προπαρασκευαστική Επιτροπή επί των εξ θεμάτων του πρώτου σταδίου, έκδ. Ορθόδοξο Κέντρο ΟικουμενικούΠατριαρχείου Chambesy Γενεύης 1971, σ. 63. Translator’s note: The official English version says "non-Orthodox” while the original Greek version says "Heterodox." "One can think of the universal Church as a communion, at various levels of fullness, of bodies that are more or less fully churches. . . . It is a real communion, realized at various degrees of density or fullness, of bodies, all of which, though some more fully than others, have a truly ecclesial character" (Francis A. Sullivan, S.J., "The Significance of the Vatican II Declaration that the Church of Christ ‘Subsists in’ the Roman Catholic Church,” in René Latourelle, ed., Vatican II: Assessment and Perspectives, Twenty-five Years After (1962–1987) (New York: Paulist Press, 1989), 283). 267. Joseph Ratzinger, "The Ecclesiology of Vatican II,” a talk given at the Pastoral Congress of the Diocese of Aversa (Italy), Sept. 15, 2001, http://www.ewtn.com/library/CURIA/CDFECCV2.HTM.